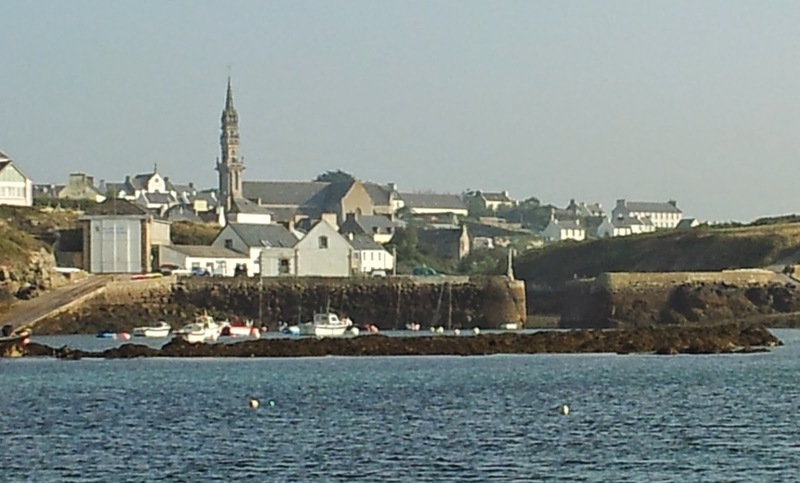 We left Ouessant on a sunny morning about an hour before LW. As a consequence many more rocks were visible as we left the sound of the main town! The strong advice in the Pilot not to take a short cut just inside the lighthouse was clearly right! Like the UK we were geting sunny and warm weather. However we were squeezed between a High over England and a Low to the south giving easterly winds which were very unseasonal! From Ouessant we again headed straight into this pattern. We had left before the tide turned to make best use of the Passage du Fromveur between Ouessant and Ile de Molene and that was successful although because of the mist we couldn't see Molene, only its lighthouse! Leaving at that time was also designed to counter the wind over tide problem and that worked for a few hours but then conditions swiftly worsened. We had thought that we might get to Roscoff but after passing L'Aber Wrac'h and with conditions deteriorating we turned back into the port. The problem of the previous four days was that the winds were invariably E, ENE or NE, the direction that we are heading. As we were also having to coexist with the strong spring tides we were invariably facing rough conditions when we were trying to go with the tide but against the wind. However a big bonus from visiting Ouessant was that we enjoyed seeing dolphins in the bay Even more satisfyingly after a couple of hours passage we had three of them began playing around the boat. They were in and out of the bow wave, twisting and turning just a metre or so in front of the boat. then one would shear off and swim parallel to Whileaway just at the surface a couple of feet away. They seemed to take turns. Magical! Their tracking of us lasted about 10 minutes and as other sailors have remarked they seem to peer up at you. Must research more about why they behave in this way. On Thursday we left L'Aber Wrac'h well before a fair tide; but by the time the tide had turned the wind was increasing, at least top of F5 and getting into F6 (up to 24kn) so we had a very rough 30 nm. This was especially so as the waves and swell worsened as we passed shallower areas of the sea bed even when shallow in this context meant 20m! We did eventually get a little respite from the rough seas once we started to get some shelter from Ile de Batz. As it was HW we used the passage between Batz and the mainland at the end of which we let the Pont Aven bound for Plymouth pass and then headed into the new Roscoff marina. Roscoff is a very attracrive town and in the event we stayed three nights. On one day we cycled many miles through the local countryside. The countryside around there is the biggest vegetable growing area in France with two particular specialisms, pink Roscoff onions and artichokes. On our last night we met up with Em and Marie of Eos whom we had last seen in Concarneau and are also on passage to southern England. They sail from Wales so we were able to learn more about favourite places there and in Ireland and W Scotland whilst we talked about Brittany and southern England. They also had some very amusing sailing stories to tell! We were up at 0520 the next morning! Slipped mooring at 0600 and headed 20nm east to Ploumanac'h. Wind (even at that time of the morning) was F4 increasing to 5. First hour was rough but then as we moved further away from Roscoff and dawn broke, the swell and the waves eased to moderate. We got to Ploughmanc'h in just under 4 hours which was good all things considered. around what is known as the Rose Granite Coast. Unusual coloured stone and different shapes. Unique landcape.That night had very nice meal, excellent moules and sardines. There is a sill in this otherwise delightful harbour so the following day we again left early, around 0630, and headed into the wind until the tide turned Again it was E5 with some very confused seas and rough cconditions (mer agitee as the French say). 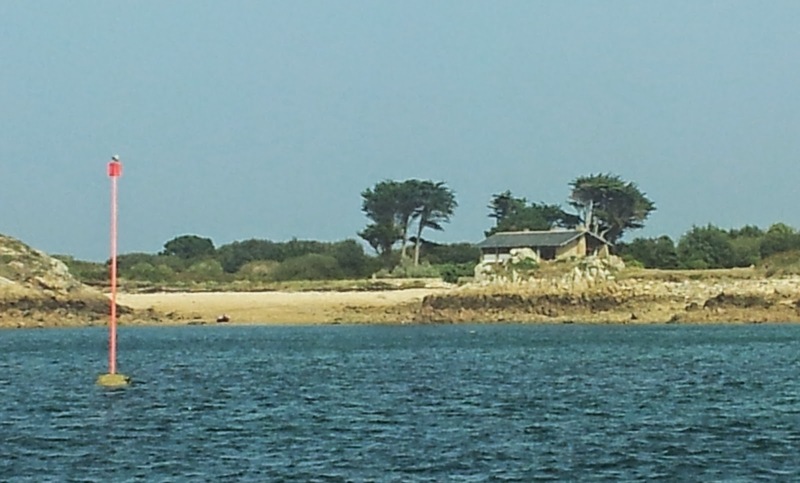 So we were glad to stick to my plan which was to get to Ile de Brehat where, at the shallow inlet of La Cordiere on the W side, we picked up a mooring and took a four hour break. Later, after navigating the narrow channel to the S of Brehat we enjoyed a very pleasant sail in a gentle F3 breeze to St Quay Portrieux where we arrived about an hour after dark. Unusually Stin Brittany St Quay has both 24 hour access and staff on duty 24 hours so we were met and assisted in by the duty HM in his dory. Very welcoming. On Wednesday we cycled to the nearby villages of Etaples and Binic, places that we had not visited before. Still warm and sunny so plenty of people enjoying this unusual September. A day later we again battled into what was to begin with an E4 but by noon was E3. 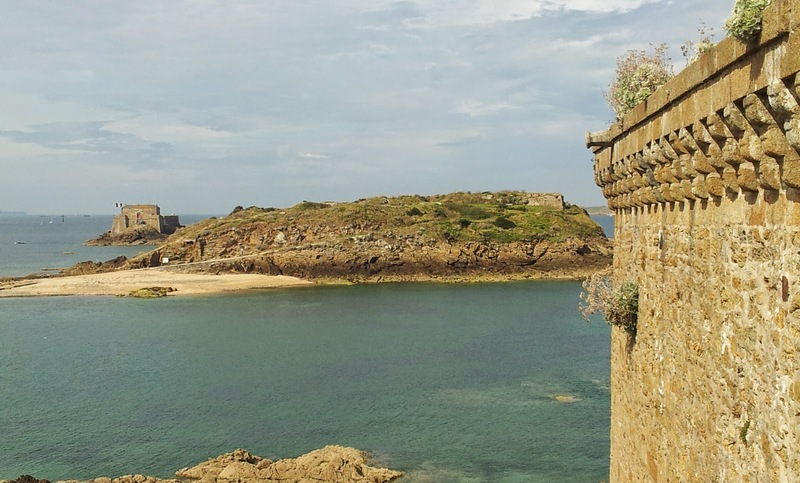 Our destination was the attractive and historic city of St Malo. We did sail some of the way but after rounding Cap Frehel decided that we would do better to motor sail closer to the wind. is looking N from the City walls. Tomorrow we plan to head N to Cartaret on the W Cotentin peninsular before sailing for Cherbourg on Sunday afternoon. Last legs now!